Pepón Osorio is an internationally recognized artist whose richly detailed work challenges the stereotypes and misconceptions that shape our view of social institutions and human relationships. The colorful, often riotous, installations for which he is best known are constructed from found objects and objects that he customizes or creates. With a wry sense of humor he probes sober topics: prison life, domestic violence, AIDS, poverty. Osorio’s collaborative pieces develop from his immersion into a community—residents of urban ethnic neighborhoods, employees who provide social services, children in foster care—and the discussions that result. As he addresses difficult themes such as race and gender, death and survival, and alienation and belonging, Osorio asks his audience to reconsider their assumptions and biases. 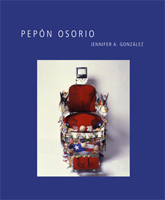 Jennifer González shows that although Osorio draws on his Puerto Rican background and the immigrant experience to create his work, his artistic statements bridge geographical barriers and class divides. "Narratively powerful (aligned with a history of visual arts storytellers like Adrian Piper and Edward Kienholz), visually compelling, and ethically just, Pepón Osorio stands as a transitional figure bridging museum installation and field-based social practices. He is, in fact, one of the first American figures in this field to focus a deeply implicated, and sympathetic, eye on the lives of the so-called others—the immigrants, the violated, and the working class—in ways that are comprehensible to people from"
— Suzanne Lacy, Chair, MFA Public Practice at Otis College of Art and Design, and editor of "Mapping the Terrain: New Genre Public Art"